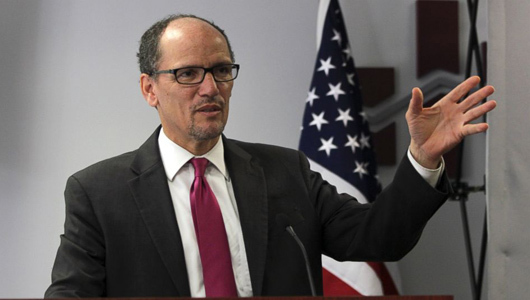 WASHINGTON – For Labor Secretary Thomas Perez, unions represent what’s right with the U.S.
Perez’ remarks are notable because they represent one of the Obama administration’s few full-throated instances of advocacy of unions before a non-union audience. While Obama himself says people should join unions – most recently in a Labor Day speech in Milwaukee – he’s restricted those remarks to appearances before union and/or partisan Democratic crowds. In his speech, Perez skipped areas where Obama and unions split: The president’s support of magnet and charter schools and conflicts with teachers unions over testing, his refusal to push the Employee Free Choice Act when Democrats ran Congress – though Obama said he would sign it – his negotiation of so-called “free trade” pacts and lobbying for “fast-track” trade treaty authority for presidents to ram the pacts through without worker rights. But after touting the statistical recovery from the Great Recession (also known as the Bush Crash) since Obama took office in 2009, Perez admitted it isn’t enough for rank-and-file workers. “The pie is getting bigger…American workers helped bake it…but they’re not getting a bigger slice. 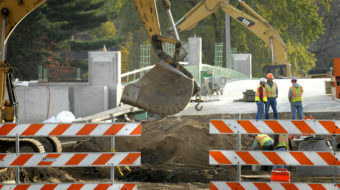 Their sweat equity hasn’t translated into financial equity,” he said. That means building a “stairway to shared prosperity” for all, Perez declared. Its steps include raising the minimum wage, building infrastructure, paid sick leave, empowering and equally paying woman workers, comprehensive immigration reform – and unionization. 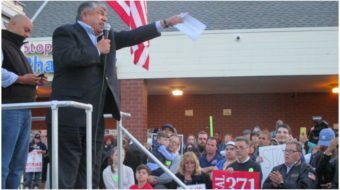 His examples of such partnerships include the Ford plant in Louisville, Kentucky, which rose from 1,000 workers in 2007 to 4,400 and rising now; joint Teamsters-UPS cooperation on “building a pipeline of skilled workers;” and joint union-management training sponsored by the Service Employees to increase the number of health care professionals. “But I’ve been around the block enough to know that you can’t stifle the voices of the American worker for long. The various movements and models – some longstanding, others emerging – give me great hope that we can fortify this critical step in the stairway of shared prosperity,” Perez said.